Wish there was a way to get more time in a day? Well there is. Not physically because we're all stuck with the 24 hour clock. But you can still live in a way that you feel that you have more time. Imagine a calmer, more rested you. Imagine feeling that you've accomplished everything you wanted to accomplish in a particular day. You don't have to just imagine this feeling. You can have it. All you have to do is apply these basic time management tips. Time Management Tip #1: Recognize you can't do it all. Too many of us are stretched too thin because we've bought into the time management myth that everyone can (and should) do it all. We should all work full-time, spend quality time with our children and spouses and pets, spend time with our friends, do volunteer and committee work, get involved in causes, work at staying fit and healthy, and spend time relaxing and rejuvenating ourselves. This kind of balancing act is best left to the Flying Wallendas. For the rest of it, it's not only untrue but can be the source of great unhappiness. And you know what? How much you do doesn't matter. What matters is that you are healthy and happy with how you’re spending your time. Decide what roles and activities are important to you and live your life accordingly. Time Management Tip #2: Prioritize. The other part of the time management myth that we all can and should do it all is that everything is equally important. It's not. Just look at your daily calendar on any given day. Is picking up the dry cleaning really as important as that meeting with a client? No. So if you have to choose between them, it's easy to decide to leave the dry cleaning pickup for another day. Don't just rush from task to task throughout the day. All that's going to do is leave you feeling tired and annoyed. Instead, for good time management, review the list of what you have to do that day at the day's start and then pick out the things that you 'must do' that day. (Try to keep these 'must-dos' to three or less for starters.) Then focus on getting those things done. At the end of the day, you'll have a feeling of accomplishment, no matter what else got messed up or went wrong. Time Management Tip #3: Learn to say "Yes" and "No". The inability to say "No" is the cause of an incredible amount of misunderstanding and frustration. Instead of saying "No," people say "Maybe" or "I might be able to do that" or "I'll see", creating the expectation that they will do whatever it is on the part of the listener and the pressure on themselves to do it. Then when they don’t do it, the person they said "Maybe" to instead of "No" is disappointed/annoyed/hurt. Make it a general rule not to say "Maybe" at all when you're asked to commit to something. Learn to make quick decisions and say "Yes" or "No" instead. And don't get hung up on elaborating. You don’t have to give extensive reasons for your decision. A simple "No, I can't do that" is enough. The person you're speaking to will appreciate your honesty and your disinclination to waste their time. And you'll be without the pressure to fit in yet another activity or event you weren't that interested in anyhow. See how much time that frees up? Time Management Tip #4: Unplug. Another modern myth that you have to disregard if you want to get more time is the idiotic idea that we all have to be reachable and 'connected' all the time. We don't, and in fact, there are times when it's important or useful to be unreachable to everyone or everything except the person or the task immediately in front of us. For instance, if your child is telling you about a traumatic thing that happened to him at school that day or you're doing an estimate for a potential customer, you need to be listening to/communicating with the people right in front of you, not the ones calling or sending you email. So recognize this and 'unplug' yourself when appropriate. Make yourself the manager of your technology rather than being managed by it. Do not read every piece of email as soon as it comes in, for example, or feel that you have to personally answer every phone call. Don't let incoming texts or tweets interrupt you when you're working. Set aside particular times of day to read or listen and respond to email, texts and phone calls. Read Top 11 Ways to Increase Productivity for more tips on working smarter so you can unplug more often. Time Management Tip #5: Take time off. Many business people in particular fall into the seven day trap. They feel that the more time they pour into their business, the more successful their business will be. Before you know it, they're working seven days a week every week and wondering why they feel so frazzled all the time! And is their business more successful? Maybe. Maybe not. You see, the success of their business depends on what they do, not on how much time they spend doing it. Consider this analogy: if you want to learn golf and you spend eight hours a day seven days a week golfing but are holding the club wrong every time so that every ball you hit has a pronounced swing to the left, what happens to your golf game? It doesn't matter how much time you put into doing something if you're not doing it right. So incorporate time off into your schedule. When you take time off, whether it's an afternoon or a weekend or a week, you return to your work refreshed and more productive, able to accomplish so much more in the amount of time available. If leaving your business or work is a problem for you, read these tips for having a worry-free vacation. 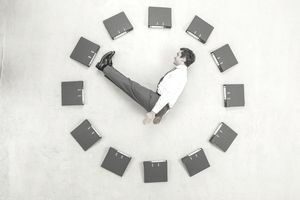 5 Time Management Tips Equals More Time? No. You won't magically get more time in a day when you put these time management tips into action. But you will be able to more effectively manage the time you have. And in terms or what you get done and how you feel, that will make all the difference.